What you’re struggling with: Lost invoices, slow approvals, missed early-payment discounts, poor efficiency and high costs due to paper-based business processes. Your fix: The paperless accounts payable solution from MetaViewer captures paper invoices and streamlines the process for receiving electronic invoices. It also gives you full visibility to all related processes from purchase order to payment. You gain more control over your accounts payable process, enhance your current ERP solution, eliminate lost discounts, reduce vendor calls, and automate your approval workflow. How can Automation Benefit Your Organization? See more, spend less with MetaViewer. The American Institute of Certified Public Accountants has determined that the average billion-dollar company processes 12,500 invoices per accounts payable employee annually at a cost of $3.55 per invoice, bringing total cost to $44,375. In contrast, the world's best finance and accounting departments process invoices at a cost of only $0.35 each, for a total cost of only $4,375. 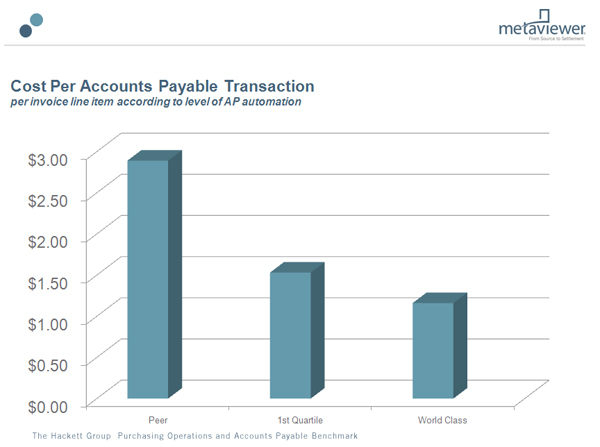 The difference between good and great is a 98% cost reduction that amounts to $40,000 in savings per accounts payable employee. In addition to those type of hard dollar savings, MetaViewer sheds light on the entire financial process with easy access to all associated documents and graphical, real-time analytics and reporting. The ability to instantly consult and involve remote offices around the world via the internet based workflows eliminates costly delays, unnecessary shipping charges and relentless phone calls. "MetaViewer has allowed us to complete tasks we couldn't complete previously. I can't even quantify the time and cost savings, but it is substantial." "The fact that MetaViewer is continually upgraded and supported by Metafile provides welcome relief from the challenge of maintaining our previous custom system. Now we get regular improvements, and the only additional cost is a small maintenance fee. All in all, we have seen major improvements in many different areas of our operations since implementing MetaViewer."